I’m just back from a couple weeks of vacation with my family. 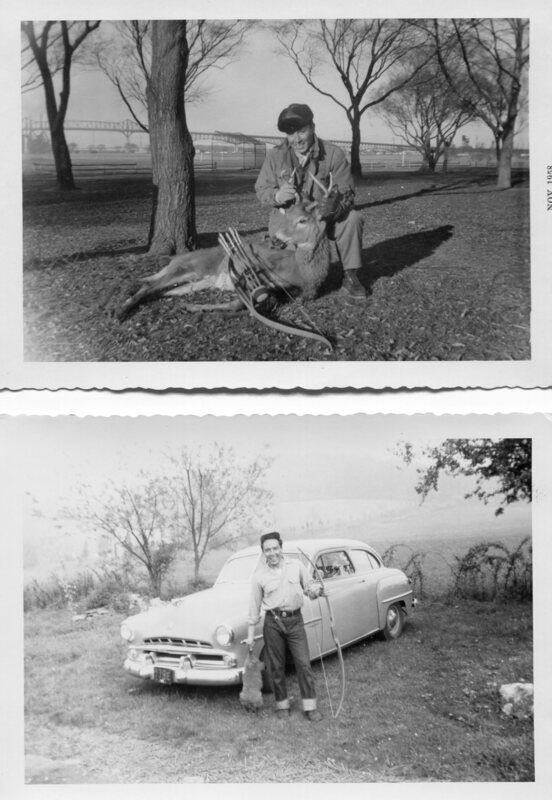 Prior to leaving ,the thought of bringing my bow, briefly crossed my mind, but it really wasn’t practical, and bringing it, would have very likely detracted from the memorable family adventure we ended up having. I did have some concern about losing ground on the work I’d been putting towards my form though, so I packed a stretch band. This turned out to be a great solution, It took minimal space, was light and it allowed me time in front of a mirror in the early mornings to practice. I discovered that the mirror/stretch band combo gave me good feedback, and helped me identify posture issues and inconsistencies in my draw. Me, while on holiday, looking a bit serious for the camera. Kiddos aside, the stretch band worked well for me, I found it helpful and an easy peasy solution to a bit of archery in your bag, travelling or otherwise. I recently had to swap out glued in points from a set of carbon arrows. 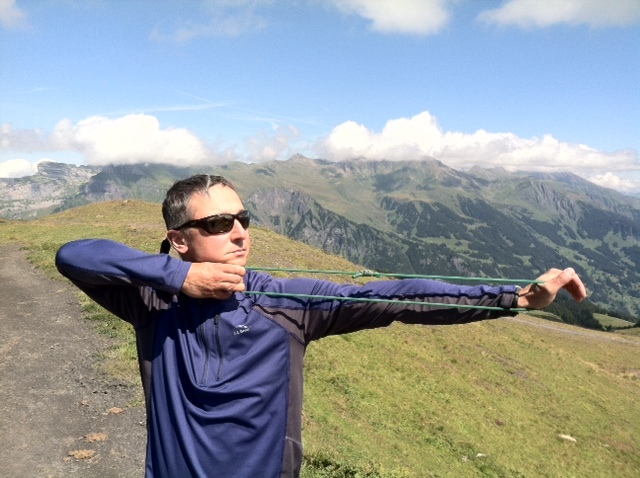 I was going from lighter points to heavier points to weaken the arrow spine. 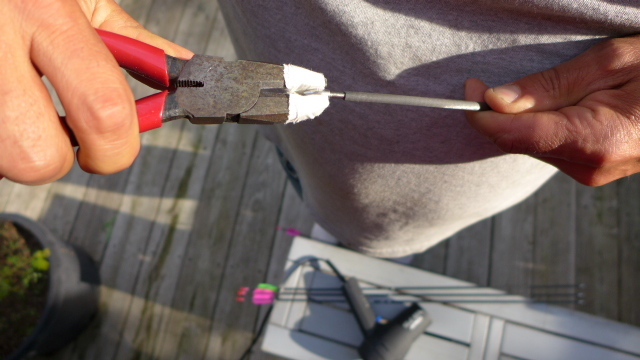 The arrows points were set in with hot melt glue, so I knew I would have to apply a heat source to the points in order to soften the glue enough to remove them. I checked the internet for options. 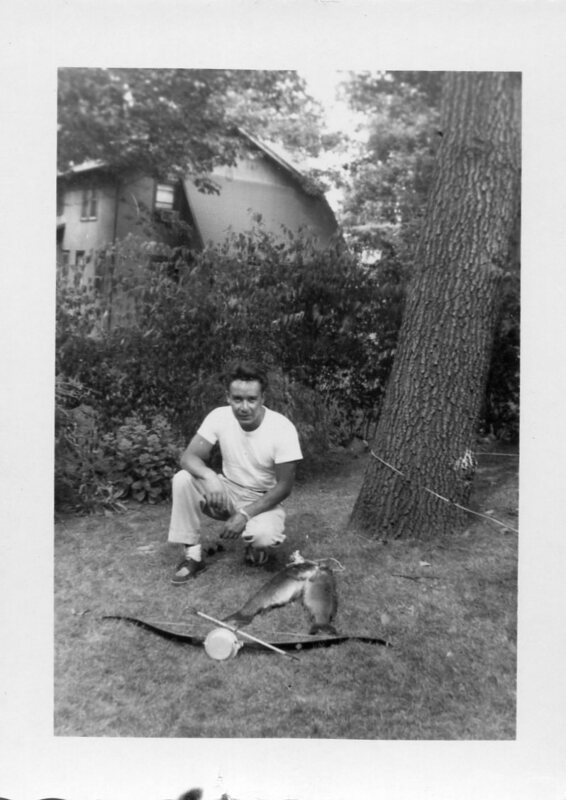 I found many suggestions on the web, torch, lighters, and others, but the two methods that caught my eye were offered by Dennis Lieu, archery coach at UC Berkeley, in this article. He suggests using hot water and or a hair dryer as the heat source. 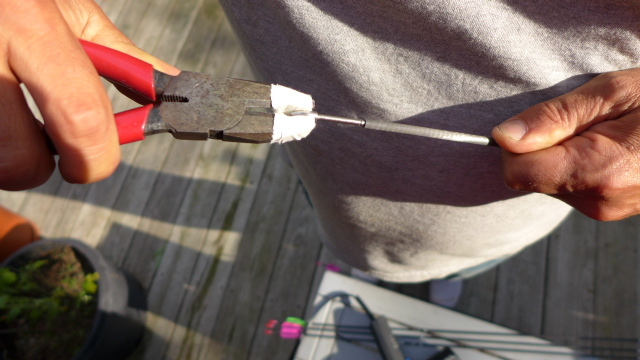 This appealed to me as these heat sources seemed more benign than a fire source and I didn’t want to over do it on my first time and risk ruining perfectly good arrows. I don’t have a hair dryer so the water method came first while I put the word out to borrow a hair dryer. 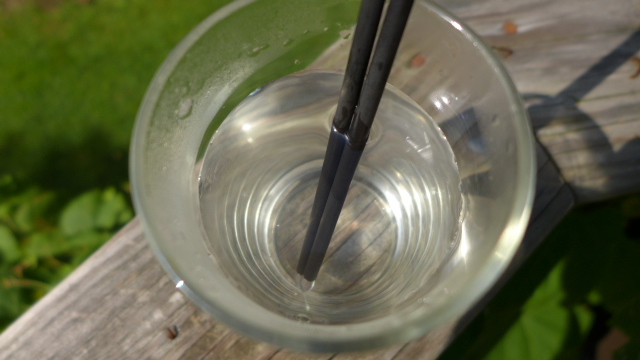 Dennis Lieu’s water method is to place a cup of water in the microwave, bring it to a boil, then dip the arrows in and pull the points, re-heating the water as necessary as it cooled down. Water boils at 212 degrees and I wondered if I could do it with less temperature. I boiled water in a kettle, and in a sturdy glass put in 1/4 of room temperature water to 3/4 boiling water, then placed my wife’s candy thermometer to see what I had. 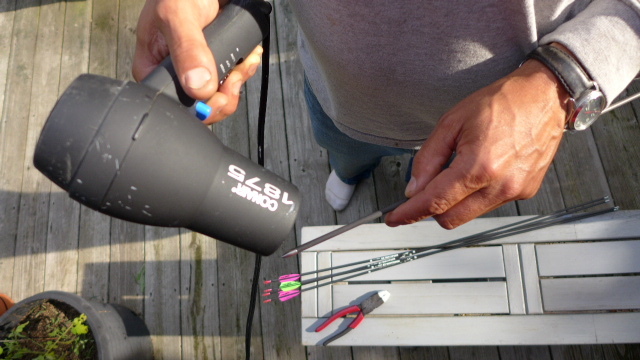 The thermometer was reading in the mid 150’s, I placed two arrows in the water, gave them what I felt was enough time (20 – 30 seconds) and tried pulling the points with a pair of linesman pliers. 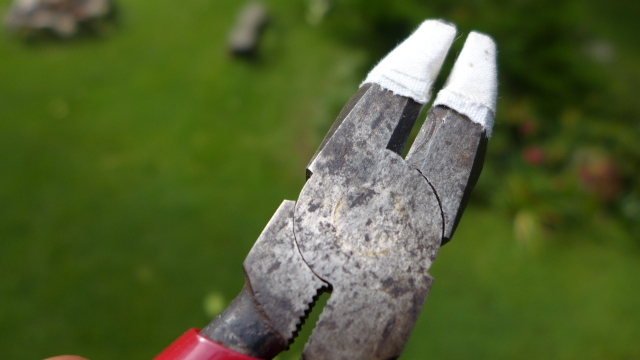 I used an old pair of linesman pliers with adhesive cloth tape wrapped around jaws, so as to not mar arrow points. The points pulled out fine, I flexed the arrows afterwards and visually inspected them, all seemed well. Meanwhile, a hair dryer had come through via a friend in town. The hair dryer was 1875 watts, which translates to plenty of heat. After getting the water temperature I was curious what temperature the hair dryer generated. 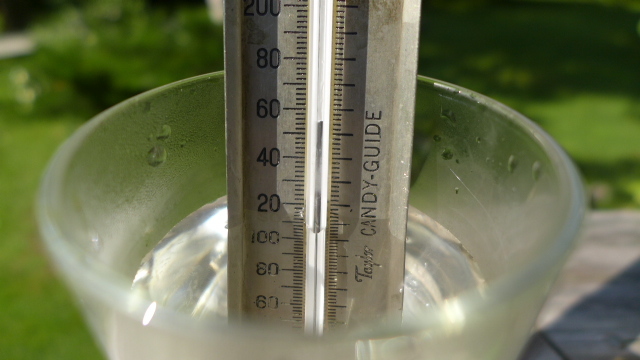 I used the same thermometer and had it consistently top out at 165 to 170 degrees. 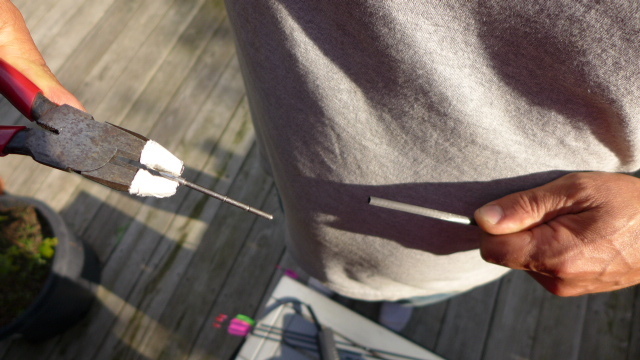 I set up out on deck for good light, and heated both the point and the first few inches of the arrow. I rotated the arrow while doing it and kept the dryer in motion to keep the heat even. I had the dryer about an inch from the shaft moving it quickly around the shaft. I had no issues pulling the points, as with the water method I flexed and inspected the shafts afterwards and could not detect any problems. Since then I’ve also shot these arrows and I can’t find any damage to the arrows using these methods. 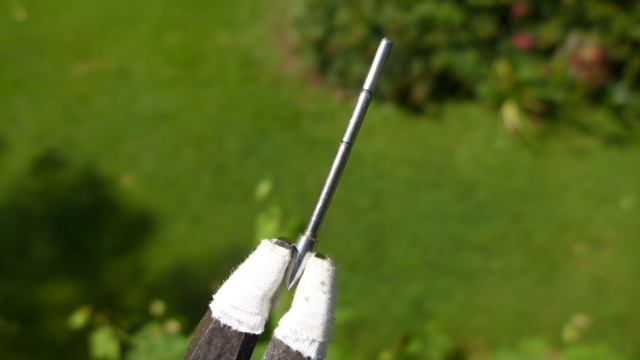 The hot melt glue used in these shafts is Flitemate hot melt glue which is a low temp glue designed for carbon arrows, you may (or may not) need higher temps if you are using a regular temperature hot melt glue. Dennis Lieu’s methods worked really well for me, it allowed me a lot of control and a mild approach to removing glued in points. In the same article he also describes his method for gluing points in with hot melt, worth a read. Find it here. I ran into this video some time ago, it shows Tyler Benner, co-author of Total Archery, explaining archery physics to High School students, very interesting. Hurricane Arthur is passing offshore of us and it is pouring, pouring, pouring. I am reminiscing of how sweet last weekend was, when I was nestled amongst the gardens, feeling the sun, in my world, letting go of arrow after arrow. On days like those, archery feels like meditation. I think it is the intense, and single focus on target and or shot sequence, that allows the mind to push everything else aside. I feel centered, and with every arrow, I’m letting go. There aren’t that many things that I do that allow me that “in the zone” sort of experience. 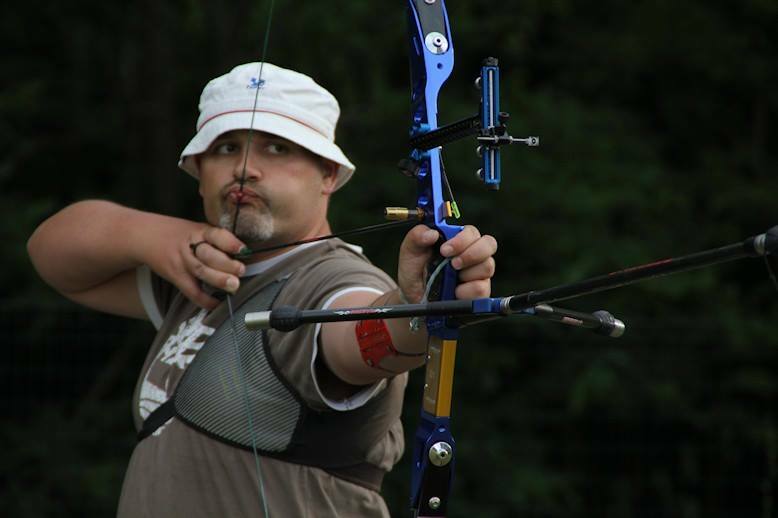 Does archery ever make you feel that way? Let me know, leave me a comment if it does. Happy Father’s day archers, and Happy Father’s day Dad! Vittorio and Michelle Frangilli have developed a new riser, the Gillo Gold Medal G1. Michelle Frangilli will debut the G1 in competition in Antalaya, Turkey for the 3rd stage of the World Cup. “This riser is the sum of our 20 years experience in riser design, made by archers for archers and targeted to people that know what they want from a riser: performance and reliability, with minimum frills and minimum price”. 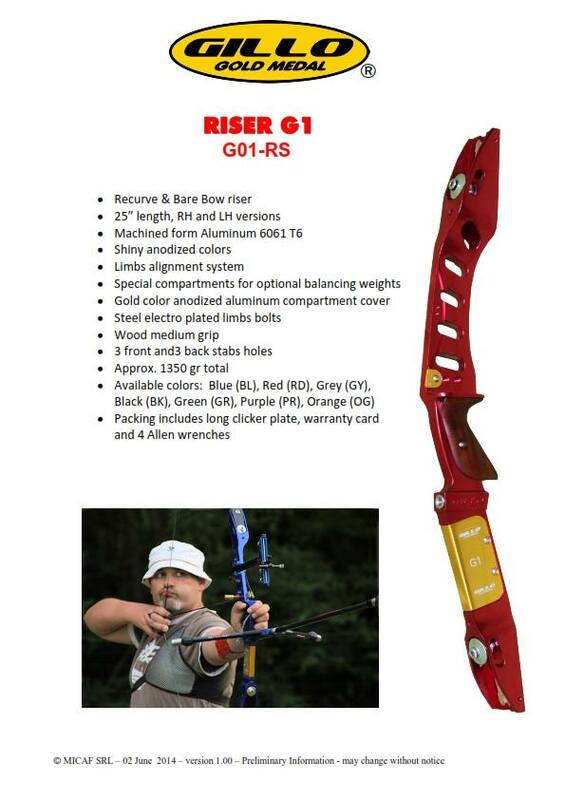 The riser is designed so it can be used as either a barebow platform or for recurve archery. Michelle Frangilli will be debuting their riser on June 10 in Antalaya, Turkey where the 3rd stage of the World Cup is being held. 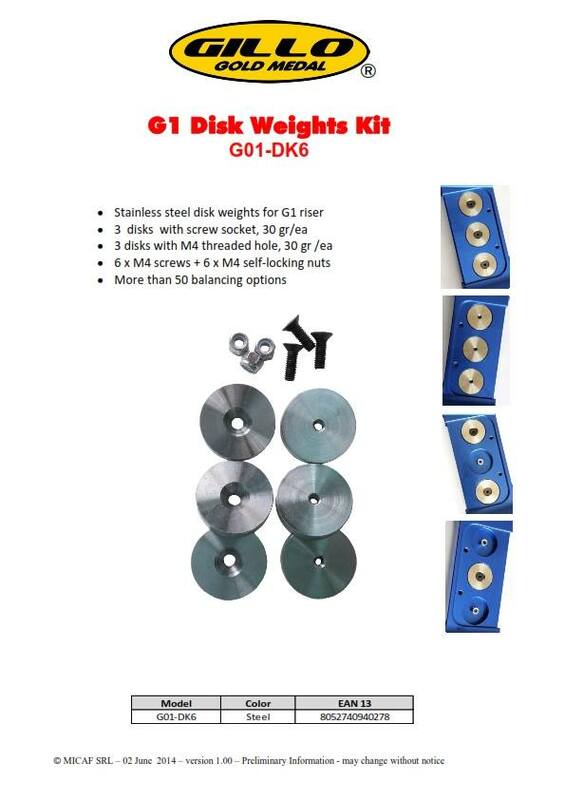 With six stabilizer holes, integral weights in the body and a combination of external barebow weights available, this riser will provide an archer many options for apportioning weight, and balance to their bows. 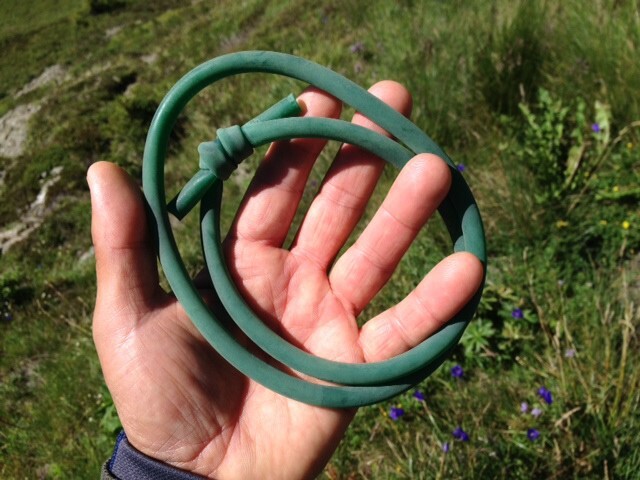 If you are a barebow archer this riser is like hitting the jackpot, the Frangilli’s have really made great efforts in providing BB accessories. The barebow external weights in aluminum (270gr) and in steel (790 gr) can also be mounted upside down for a totally different feel. 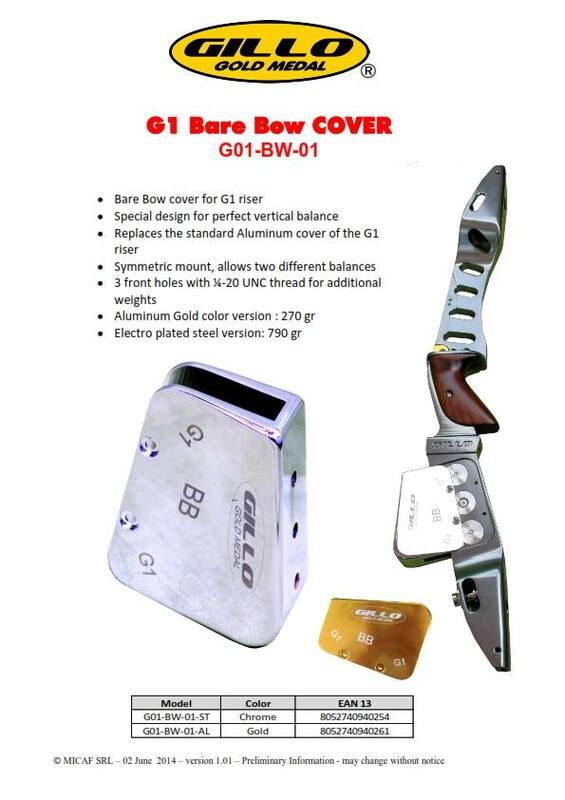 Somebody on the net calculated 320 different ways to add weight and personalize the feel of this riser by also using the holes on the barebow external weights. Alternative Sporting Services – http://www.alternativess.com/cgi-bin/start.cgi/shop/dev/main.htm? Congratulations to the Frangilli’s on what appears to be a real winner. Do you have a hard time remembering tuning rules? 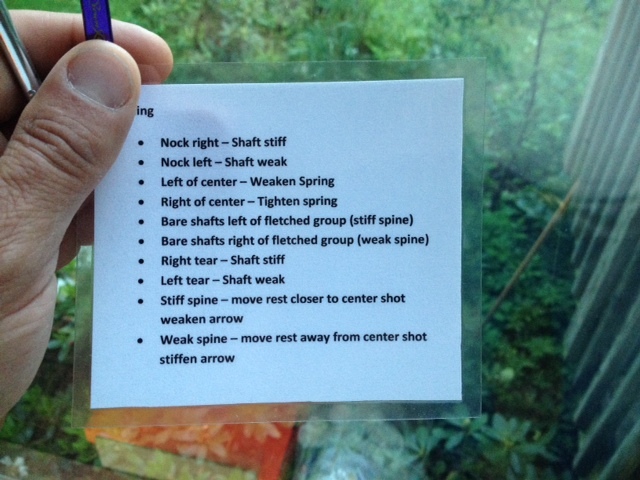 To help myself out I made a reference card that hangs on my quiver. It is helpful when I can’t remember if tightening the spring on my plunger moves the arrow left or right, or if bareshafts left of the fletched group indicate stiff spine or weak spine, etc. I am right handed so the stuff on this sheet is of course for right handed shooters. There are plenty of rules missing, I just jot the rules I can’t easily remember. Not all the rules are on this sheet just the stuff I sometimes have to scratch my head a bit to remember. It saves me having to stop what I’m doing, go inside and look it up. It is also helpful at the range where I don’t want to carry a reference book around or to help somebody out who is tuning their rig. I find having one useful. 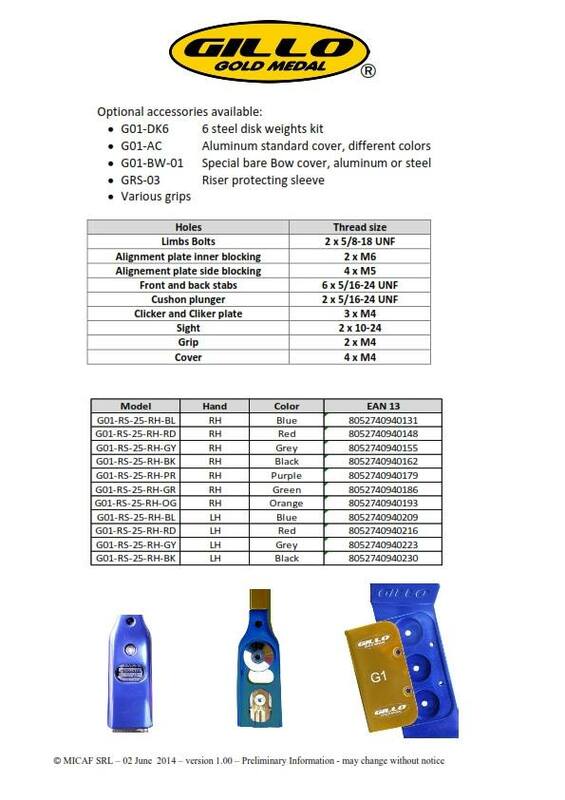 If you decide to make one up, customize it with the info you need.